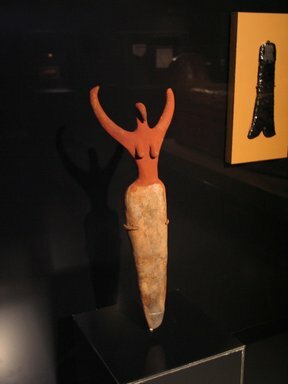 Pottery figurine of a woman, similar to No. 505, but narrower. Small head, with beak-like face, on long neck, expanding to shoulders. Rather long breasts. Waist gracefully curving into uplifted arms, with hands turned in and pointed, thumbs detached, fingers separated by sharp grooves on both sides, and probably graded as in No. 505; wrists and elbows not indicated. Long legs, without feet, peg-shaped, their separation indicated by very shallow groove. Proportions rather more elongated than natural. "Steatopygy" pronounced; torso flat. Fine brownish pottery, painted red no body; black (thickly laid on) on hair; whitish, indicating cloth, from hips down; blackened near "feet" in front. Very fine specimen. Condition: Lacking left hand and fingers of right hand. Lower part repaired, twice near "knees"; right arm repaired at elbow; left arm repaired at shoulders. Some repainting on torso. White paint and "hair" mostly lost.